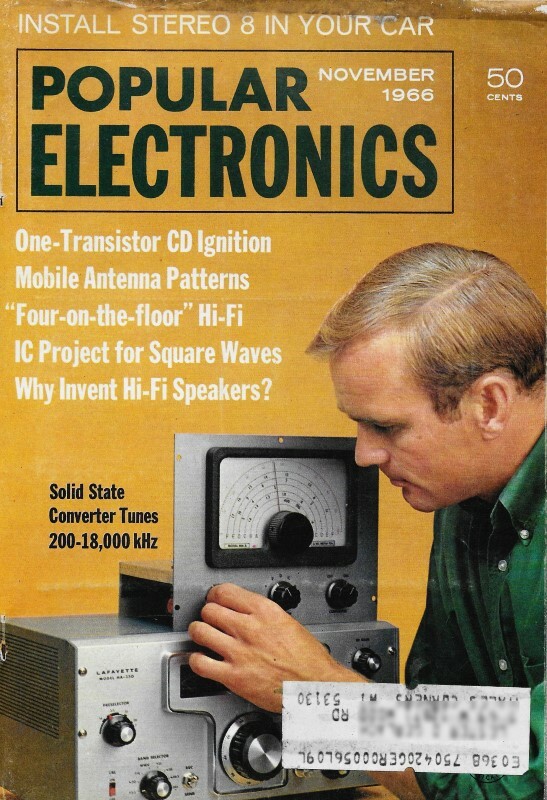 This article in a 1966 issue of Popular Electronics presents a surprising and almost counterintuitive (to those uninitiated in antenna physics) result when measuring the radiation pattern of a CB-type antenna mounted at various points on a car. 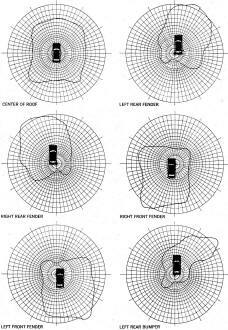 If you were asked to make a rough sketch of the radiation pattern when the antenna is mounted in the center of the roof, center of the trunk, and on each of the front and rear and left and right fenders, would yours look like those in the article (assuming an all-metal car)? Today, there are many electromagnetic radiation pattern simulators available to help predict antenna performance in just about any scenario imaginable. Design verification is then usually performed either in actual operational conditions, in anechoic chambers, in TEM cells, or on outdoor test sites. Being able to accomplish the initial simulation using highly refined software algorithms can save huge amounts of money and time, just as with circuit simulation and PCB / enclosure layout. In 1966, only government, university, and large corporations had the resources to employ large mainframe computers for the task, and even then the capability was significantly less than what can be accomplished on an iPhone today. For the vast majority of people, antenna radiation pattern testing was purely an empirical exercise after making a best guess at fabricating a physical unit. Every Ham or CB'er with a mobile rig should be aware that antenna placement is equally as critical as selecting the mobile antenna itself. Furthermore, neither the antenna nor the mounting position should be chosen independently and without due consideration of the other. When a position is arbitrarily selected, the results may be disappointing. If they are, many hams and CB'ers start grumbling about the manufacturer of the antenna, or even the qualities of the transceiver, whereas the fault is simply that not enough thought was given to the actual placement of the antenna on the automobile body. The Best Positions. No matter how you look at it, the best possible position for a mobile antenna is in the middle of the roof of a sedan or station wagon. When mounted in that position, the antenna "sees" the car body as a large mass of metal permitting symmetrical radiation of your signals*. This effect is shown graphically in the drawings at right. Note that the signal is fairly uniform in all directions, and turning the car should introduce little signal fading or sudden signal drop-outs. Many people cannot bring themselves to drill even a small hole in the middle of their car roof**. If this is a consideration, or if you have a convertible, the next best position is in the middle of the trunk lid. Of course, there will be a slight shift in the radiated pattern as more metal is toward the front of the car than toward the sides or rear. However, this causes little decrease in antenna efficiency. A second factor favoring the trunk lid position is the height of the antenna. A center-of-the-roof-top antenna might be troublesome if taller than 18" or 20". A trunk lid mounting permits use of a 40" antenna, which increases the radiating efficiency over a broader bandwidth. The illuminated areas above represent actual intensity and azimuth measurements made at the testing facilities of Hy-Gain Electronics. The antenna used was a full-length 108-inch whip tuned to 27.065 MHz. The roof-top mount is the best position for all-round radiation, the left rear bumper just about the worst - except in its favored direction where the lobe is substantially stronger. When the car is in motion and turning, you can see why there are extreme variations in signal strength. Fender Mounting. In an effort to simulate the appearance of cars with commercial radiotelephone installations, a favored spot for many CB antennas is either of the rear fenders. 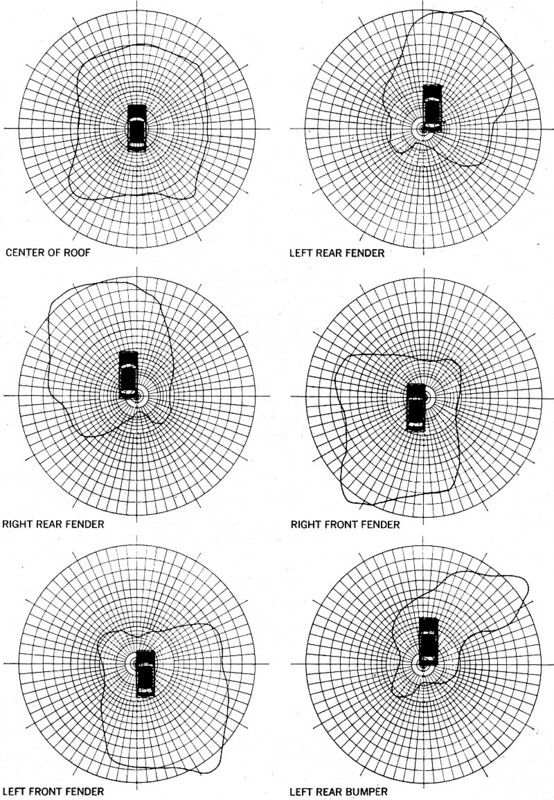 Shifting the antenna to either the right or left fender moves the metal mass and, as can be seen in the antenna pattern drawings, maximum signal radiation crosses diagonally through the car and out toward the opposite front fender. Cowl or front fender mounting is becoming quite common - especially in view of the availability of combination AM radio/CB antennas. Locating the antenna on either front cowl reverses the metal mass distribution and the signal is pulled toward the rear of the car and opposite to the front mounting. Note that in all of the antenna pattern diagrams the scale is constant, and it is really true that more signal is concentrated in the direction of the lobe. But, this is a tremendous disadvantage if the car is moving and not aimed in the direction of that lobe. For example, compare the left-rear-fender mounting pattern with the roof-top mounting pattern. The signal strength through the right front fender is somewhat above that radiated by the roof-top antenna, but from azimuth 130° to around 325°, the radiated signal is substantially weaker. Worst Possible Placement. Pity the unfortunate soul that cannot bring himself to drill a hole in his car body. This fellow frequently chooses a rear bumper mount. Results to be expected from such a mounting appear in the last drawing on page 65. The lobe pattern has been distorted and the car body is now absorbing some of the radiated signal. If this pattern is compared with the left fender mounting pattern, it is easy to see how positioning the base of the antenna lower on the car body has adversely affected the pattern. All of the tests illustrated in this article were made with the cooperation of Hy-Gain Electronics and through the use of its testing facilities. 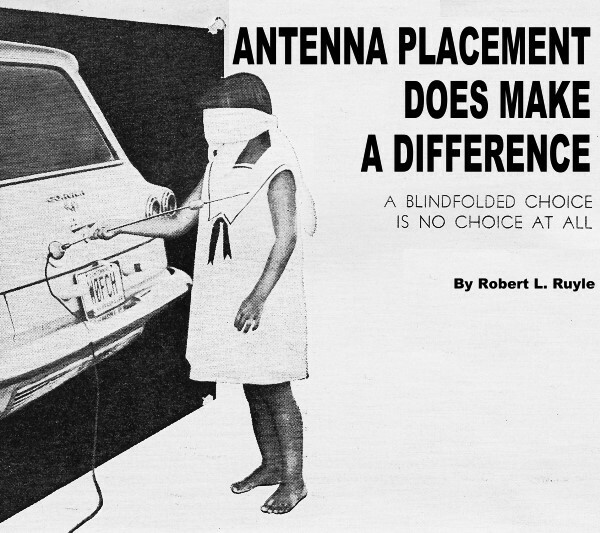 The antenna used in each instance was a 108" whip. All of the patterns would be influenced to some extent by the substitution of a different antenna. * Although reference is made in this article to transmitting, the identical effects are observed when receiving a base station on your mobile rig. The lobe patterns then show the extent and azimuth of maximum signal pickup. ** At least one manufacturer has a roof-top antenna that does not require a hole - the antenna being held in place by a powerful circular magnet.